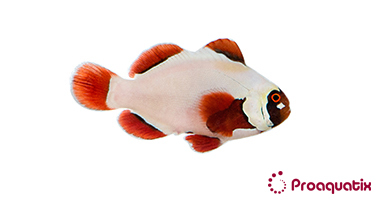 The Gold Nugget Maroon is a designer variant of the Gold Stripe Maroon clownfish. This designer Maroon clownfish goes through a color transition as it matures, where the body changes from white to brilliant gold. Their fins are maroon in color, like wild-type Premnas biaculeatus.